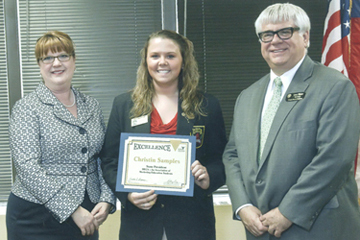 The Career, Technical, and Agricultural Education (CTAE) Division of the Georgia Department of Education is responsible for, among other things, the career and leadership development of students in middle school and high school across the state. In that role, CTAE sponsors and works in concert with a number of Career and Technical Student Organizations (CTSO). Many of these organizations are state chapters of national organizations, with the aid of multiple corporate sponsors, have succeeded in developing effective programs to instruct and challenge students. CTAE Programs engage students in career related, authentic learning experiences that lead to graduation, post secondary education opportunities, and work readiness. CTI - Miss Alicia Monique Hamlin – CTI State President - Alicia is currently a Senior at Southwest Magnet High School & Law Academy in Macon. 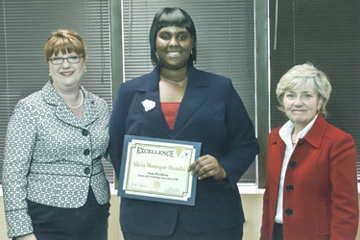 She has been a part of the CTI Program under the leadership of her Coordinator, Mrs. Sheila Hughes. Alicia states that CTI has given her the confidence to know that she can achieve anything she puts her mind to. After graduation, she plans to attend Middle Georgia Technical College to pursue a degree in the Nursing & Medical field. She chose this career because she had a nurturing experience with her mother until her death a few years ago. She feels that this career will give her the encouragement & inspiration to help others. She has the ability to work with others and provide the kind of care that fosters advancement in the Medical field. SkillsUSA – Ms. Victoria Slagle – SkillsUSA State President - Victoria has been a member of SkillsUSA since she was in the ninth grade. Her involvement has provided her with many opportunities to expand her technical and leadership abilities. 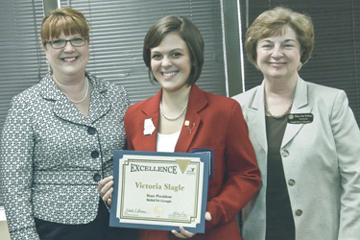 Victoria represented the state as the gold medal winner in Screen Printing in 2007 and travel to the National Leadership and Skills Conference in Kansas City to compete and become the National Silver Medalist. 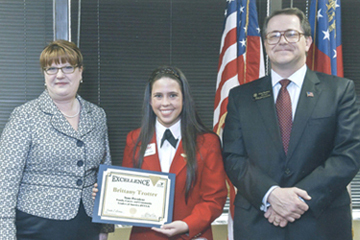 For the past two years, Victoria has served as a SkillsUSA Georgia State Officer; in her junior year as State Treasurer and this year as the State President. Victoria has worked with business and industry over the past year to further the cause of Career, Technical and Agricultural Education as she has spread the mission of our organization and its benefits. Along with serving her organization, Victoria has a passion for helping others and demonstrates that as a community volunteer. FBLA - Mr. Cody Batchelor – FBLA State President - Cody is a senior at Jasper County High School in Monticello--he has resided in Jasper County his entire life. He has been involved in sports and academic pursuits in his high school career: ranging from baseball to Debate. Cody has recently served as Georgia Future Business Leaders of America’s state president and in doing so, has led over 23,000 students across Georgia in business and career development. 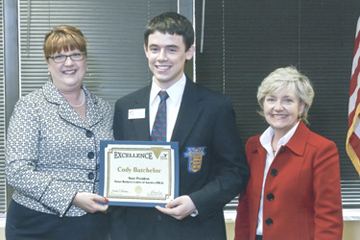 At our State Leadership Conference, Cody was recognized as one of the top FBLA members in the nation and will be recognized at our National Leadership Conference in Anaheim this summer. He has not quite decided where he will attend college in the fall but has set his sights on LSU, University of Miami, and Princeton. DECA - Miss Christin Samples – DECA State President - 2008-09 Georgia DECA State President; four year DECA member; former DECA State Vice President of Civic Consciousness; received numerous 1st place regional and state awards; Top 16 National DECA Finalist in Entrepreneurship Participating Creating a Franchise Business Plan; Student Council; competition cheerleader; Youth Leadership Hall Team Member; honor roll; National Honor Society CTAE Award Recognition – serving as the Georgia DECA State President – receiving award for her example of leadership in a student organization, her community service involvement, numerous awards and honors earned over the past four years, dedication and commitment to Georgia DECA. FFA - Mr. Seth Stowers – FFA State Vice-President - Seth Stowers is the State Vice-President of the Georgia FFA Association this year. Seth is a senior at Dawson County High School. 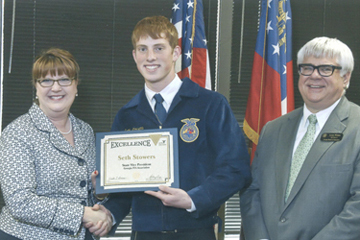 Seth and his teammates represent the over 28,400 FFA members in Georgia. As state officers they travel across the state spreading the message of agricultural education and the FFA. The Georgia FFA Association is the 3rd largest in the nation. The 2008-2009 state FFA officer team has conducted chapter visits, hosted FFA Day at the State Capitol, served as voting delegates at the National FFA Convention, and conducted leadership conferences for over 1,500 students already this year. Nearly 3,000 FFA members are expected to attend the 81st Georgia FFA Convention on April 23-25, in Macon, where the state officer team will preside. The FFA is an integral part of Agricultural Education. The FFA strives to make a positive difference in the lives of student by developing their potential for premier leadership, personal growth, and career success through agricultural education. TSA - Mr. Osayande Imarhiagbe – TSA State Treasurer - Osayande Imarhiagbe is a senior at Riverdale High School. 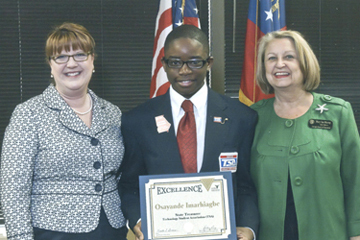 In addition to leading his local TSA chapter as President this year, he also served as GA TSA State Treasurer. He is a state and national award winning website designer and works on the Clayton County Public Schools website. Osay has been a shining example of what is right and valuable in our schools today. In addition to his TSA Chapter website and the system website, Osay is creating a Teen Driving Site at the Request of the Georgia Department of Transportation. He will be featured in their statewide news magazine soon. His TSA Chapter website, www.riverdaletechnology.com, has been selected by national publication, Tech Directions Magazine, as their “Website of the Month”. He, and Mr. Price were interviewed and will be featured in an upcoming issue. The nomination for this recognition came from an individual in Kentucky. Osayande has met with his state legislators in support of our CTSOs. 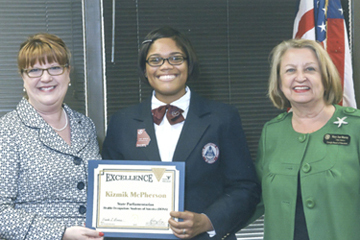 HOSA – Ms. Kizmik McPherson – HOSA State Parliamentarian - Kizmik was elected as a state officer in March 2008. She has always been a positive an inspiring member of the state officer team and has always completed her assignments on time. Kizmik is caring, punctual, passionate about HOSA and CTAE, and is able to make decisions while thinking out of the box. Although she will be missed by the staff of Georgia HOSA, we are proud to know she has made an unforgettable impact on Georgia HOSA. FCCLA - Miss Brittany Trotter – FCCLA State President - Brittany represents the Georgia Association of Family, Career and Community Leaders of America (FCCLA) as the 2008-2009 State President. She has led the organization to be the largest FCCLA in the nation with over 28,000 members. Brittany will be receiving the National FCCLA Beth Middleton Memorial Scholarship at this year’s National Leadership Conference in Nashville, TN. She will also be receiving the Janet McGarity Barber Scholarship in honor of the first FHA State Adviser. Brittany has benefited from her experiences with FCCLA and has grown to be an exceptional leader among her friends, family and community. Not pictured: GCSA – Mr. Wes Seabolt – GCSA State President - Wes has served as a GCSA State Officer for the past two years, first as historian in 2007-08 and is currently serving as the State President. Wes is also currently serving on the State Superintendent’s Student Advisory Council. At Madison County High Wes is involved in the drama program, is a member of the Tennis team and the yearbook staff. Wes will be attending Middle Georgia College in the fall.